In 2002, I visited my godmother “Aunt Jackie” in Manhattan. She was always quick with ideas for things do, and knowing I enjoyed quilts, she told me to go straight to the Whitney to see the incredible new quilt exhibit. It was The Quilts of Gee’s Bend. The only other quilt exhibit I’d seen was 19th century Applique Quilts at the Philadelphia Museum of Art, and The Quilts of Gee’s Bend was in sharp contrast. Lutisha Pettway’s oddly shaped, grungy denim work clothes quilt was the first thing I saw at the Whitney. I knew right away I was looking at something great. Almost immediately, the quilt market was flooded with so-called African-American quilts – improvisational Southern utility quilts. To me, it seemed unlikely that a singular aesthetic could be designated as representative of such a large, diverse culture. Soon, I discovered Cuesta Benberry, whose pioneering efforts in researching American quilts eventually focused on African-American quilts. Benberry countered previous theories on African-American quilts being associated with a single visual style by showing the variety of styles and techniques in African-American quilts. Seeing such a wide range of quilts in her book “Always There: The African-American Presence in American Quilts” was a moment of clarity. Several years later, in October, 2010, I spotted a Facebook status update from Kyra Hicks, quiltmaker and author of “Black Threads: An African American Quilting Sourcebook”. She was selling quilts on eBay, and one of those was from Gee’s Bend – $50 start price, no reserve! The quilt was attributed to Polly Raymond, daughter of Lucy Mingo. Raymond was one of ten children, seven girls, but I didn’t know anything more. I watched the auction all week and logged in toward the end, expecting to see the price to skyrocket in the final moments. However, there was only one other bidder. My insanely high, last minute sniper bid wasn’t needed. I won the quilt for $51. Of course, I wanted to find out more about Polly Raymond, so I asked another Facebook friend, author, scholar and quiltmaker Carolyn Mazloomi, who appears in “Why Quilts Matter”. I’ll never forget what she said. “Actually, your quilt was made by Lucy Mingo.” I was absolutely thunderstruck. How could it be? 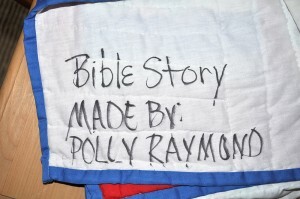 The name Polly Raymond appeared in bold, black magic marker on the back, along with the title, “Bible Story”. Mazloomi told me she was the one who originally bought the quilt from Lucy. You could’ve knocked me over with a feather. 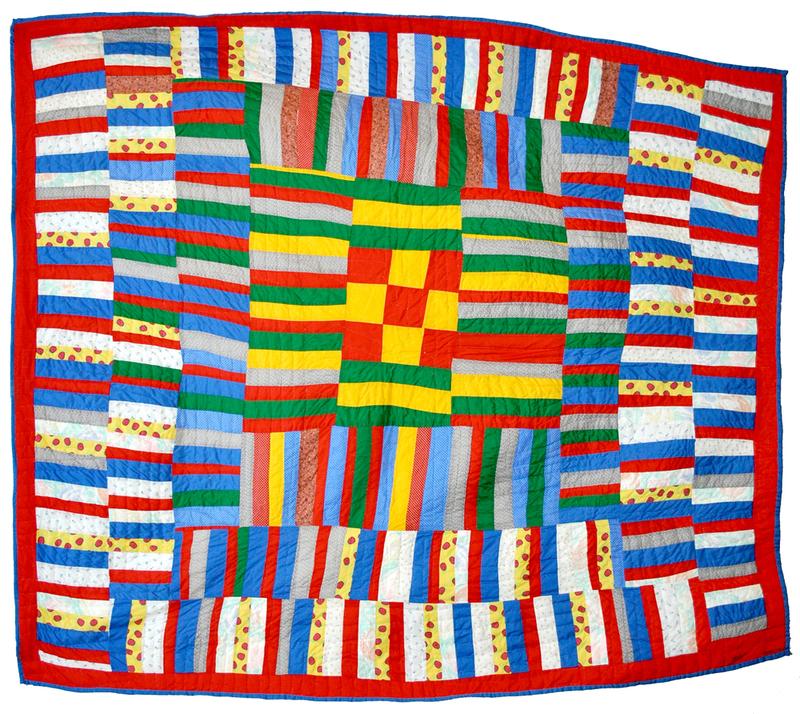 Lucy Mingo was part of the Freedom Quilting Bee of the 1960s and 70s. She was an active participant in the Civil Rights movement, and marched to Selma, Alabama, with Martin Luther King, Jr., to protest for the right to vote. Lucy had her own reasons for writing Polly’s name on the quilt, but the important thing was getting the correct attribution directly from her. I had to find Lucy. I remembered seeing pictures of Lucy on a blog by Joe Cunningham, aka “Joe the Quilter” who is a Facebook friend through Julie Silber. Joe had Lucy’s address, and she called the day she received my letter. I was so excited I was shaking. She confirmed the story about the quilt and was hoping to make it to Sisters, Oregon, for the 2011 Quilter’s Affair and Sisters Outdoor Quilt Show. I said I’d see her there. On Friday, July 8th, 2011, I met Lucy Mingo. 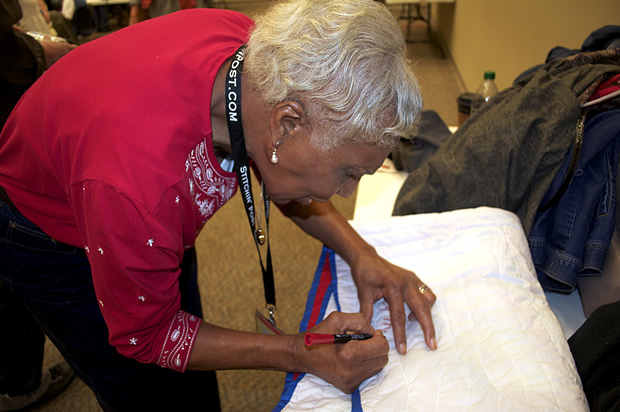 She was in a class with the other quiltmakers from Gee’s Bend, and was teaching students about making quilts. When I stepped in the room, Lucy just glowed. She came over, said hello and signed the quilt. I was in awe, and could barely speak. 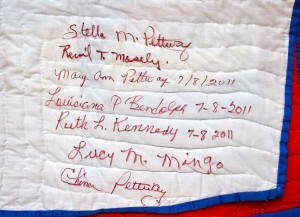 When I turned to say hello to Matt Arnett, Lucy got all the other ladies to sign the quilt. Needless to say, I was speechless. Where can an exhibit of the Gee’s Bend quilts be seen?? Hopefully they’ll be coming to a location near you soon, but if not, the books , dvd, music cd, etc., are all highly recommended! Myra, you can also get in touch with Matt Arnett on Facebook (Matt “is a photographer, filmmaker, curator, and researcher whose interest is in the art and culture of the African American South.” — more his bio here: http://www.whyquiltsmatter.org/welcome/in-the-series/), and take a look at the spring schedule of the Frist Art Center in Nashville (http://fristcenter.org/). Please share your findings, either on our Website or on Facebook! Thank you. I visited the Gee’s Bend Quilters last year this time. Lucy Mingo and the other quilters changed my life. It was the most amazing event of my life.